With the arrival of spring, cutting the grass becomes another weekly ritual to promoting the health and beauty of a great looking lawn and landscape. But many homeowners don’t realize it’s not necessary to bag those grass clippings. In fact, leaving them on your lawn offers several advantages. Grasscycling is the natural recycling of grass clippings by leaving them on your lawn when mowing, rather than bagging and removing them. It’s such a simple way to mow; I don’t know why more people don’t do it. Actually I do. My mother was one of those people. After she retired, I would go over and cut her grass, but I wouldn’t bag the clippings. Instead, my mower did a fine job of cutting those blades into pieces so small, it was impossible to find them. But mom was always concerned that by not bagging the clippings, thatch would build up, weed seeds would be scattered everywhere, and it just wouldn’t look as good. And I’d say; “wrong, wrong and wrong”. According to university studies and numerous research, it is a common misconception that grass clippings are a major cause of thatch buildup in lawns. Thatch buildup is caused by grass stems, shoots and roots, not grass clippings. Clippings, which consist of about 75% water, decompose quickly while adding nutrients to the soil. Studies indicate that by leaving grass clippings on your lawn, as they decompose they contribute enough organic matter and nitrogen, that lawn fertilization needs are reduced by about 25% per year. One of the keys to proper grasscycling is to remove only one third of the grass blade each time you mow, always keeping in mind the recommended height for your type of grass. This may necessitate that you cut your grass a bit more frequently, especially during peak growing times. Consistent, regular mowing reduces the chances of weeds going to seed and being disbursed naturally in your yard. It’s also important to use a sharp blade. Sharp blades make clean cuts, thus reducing the chance for lawn diseases and pests. A healthy lawn is a lush lawn and one that does not create a favorable environment for weeds to grow and flourish. The key to having a freshly cut lawn, free of unsightly clippings is to make note of the comments above. Again, always use a sharp mower blade to ensure a clean cut. 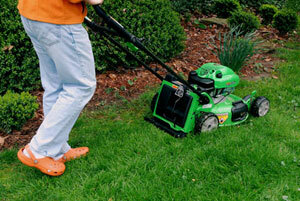 Avoid cutting off more than a third of the grass blade any time you mow. This not only reduces the size of the clippings, it is also less stressful on the grass. Finally, don’t mow when the grass is wet. Clumps will ultimately develop, no matter how hard you try to avoid it. If you follow these guidelines, you can zip through your mowing sessions faster than ever, add back valuable, organic nutrients into your lawn, keep excess waste out of the landfill and still achieve neat, tidy results. Even after my mother won the coveted “neighborhood lawn of the month” award, I’m not sure I ever sold her on the virtues of grasscycling. Mom finally moved to an apartment before we ever resolved that debate. I think she did that rather than concede and allow me to freely go “bag less” in her yard whenever I wanted. She’s as stubborn as she is sweet. Well this is also what I think, however, I’m having one heck of a time finding a mower that is bagless or side discharge. I did see one on sale in Canada! But geez! Any ideas??? Wow Suzanne, I thought nearly all side discharge mowers these days offered a mulching option. In my experience, there is a metal plate that covers the side discharge shoot and forces the clippings to remain in the deck area for additional cutting before falling into the ground. All major manufacturers and even the cheap brands offer this in the states and I’m sure in Canada. Reinvestigate this and be sure to use the term “mulching mower” to see what you find.